Custom Trophy Belt Buckle 6606 from Montana Silversmiths. Custom Trophy Belt Buckle 6606 by Montana Silversmiths. Very fancy gold and copper filigree buckle with the background color of your choice. 3 5/8" x 4 1/2". Date trim, "CHAMPION", and single stone are included. Enter your engraving and other options in the form below, then click "Yes! Add to Shopping Cart and apply Instant Rebate Now!". Shown with team ropers figure 625, Leather Brown background and emerald green stone. 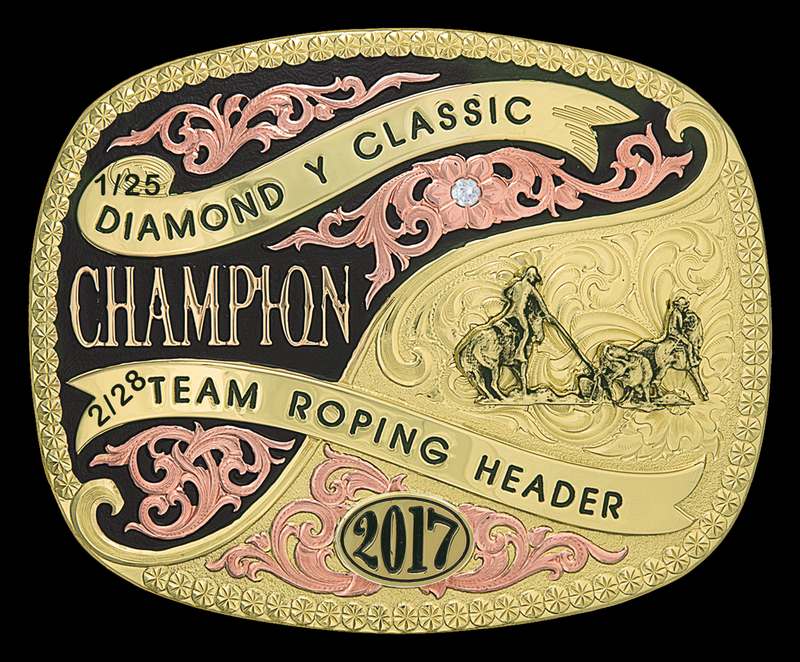 The word "CHAMPION" is the only raised lettering option available, cannot be changed and is included in the price but the ribbons can be engraved. Features the rugged, tarnish-free MontanaArmor™ finish. Please allow 4-6 weeks to ship.